The number of foreign-born players in America's professional National Basketball Association has tripled in the past two decades. One of the veterans - San Antonio Spurs' Tony Parker - and a rookie - Washington Wizards' Hamady Ndiaye - talk about their respective experiences as foreigners in the NBA. For NBA fans, Tony Parker is a household name, a 10-year veteran on one of the best teams in the league. Hamady Ndiaye is a little-known rookie on a team that loses far more often than it wins. What these two players have in common is they both grew up outside of the United States. Parker is fortunate to be playing for one of the National Basketball Association's best teams, the San Antonio Spurs. The Spurs have won four NBA titles in the past 12 seasons and have high hopes for another one. Two-thirds of the way through the season they have the best record in the league, having won 84 percent of their games with a 46-9 mark through February 17. They recently scored a lopsided win over the struggling Washington Wizards in the nation's capital. Although he scored the most points for the Spurs, Parker still credited the team. "It was a great team win," said Parker. "The team played great, everybody contributed; so it was a great win." He was drafted in 2001 when he was only 19 years old. In only his second season with San Antonio, the Spurs won their second NBA title - their first came in 1999 - and they added championships in 2005 and 2007, when Parker was named Most Valuable Player. Parker was born in Belgium to a Dutch mother and an African-American father, but grew up in France, where football (soccer) is one of the most popular sports. "When we grew up basketball was in our family. We were big Chicago Bulls fans because my dad is from Chicago, so we always played basketball. That was the main sport in the family." Parker's father played professional basketball in Europe and one of his two brothers currently plays in France. He says basketball is one of the reasons he loves living in the United States and he's happy in San Antonio, Texas. "I am feeling very blessed and very lucky to be in a great organization, a great team. This year we are having a great year." While Parker is considered a veteran since he has been with the Spurs for about a decade, Hamady Ndiaye of the Washington Wizards is a rookie in the NBA, being drafted last year out of Rutgers University in New Jersey. A native of Senegal, Ndiaye is 2.1-meters (7 feet) - tall and recently celebrated his 24th birthday. The Wizards have won only 27 percent of their games so far this season - with a 15-54 record through February 17 - but the rookie remains upbeat. "Well, it is very tough for the whole team and for me in particular," said Ndiaye. "I just came back from the D-league and I try to help these guys out at practice. Seeing us lose this hard, we [have] to pick it up real quick and move on. We got one coming up tomorrow. Hopefully we will get together and come in ready." Ndiaye was born in Dakar, but says he spent a lot of time in Saly and Ngaparu, two resort towns with scores of hotels and luxury residences spread along their beaches. He credits one person, Babacar Sy, not only for teaching him the basics in basketball when he was 15, but also with finding him a scholarship at a high school in California. He later would get another scholarship to Rutgers, where he played for four years and eventually earned a communications degree. 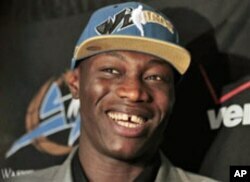 Although playing in the NBA is a dream come true, Ndiaye said there also are some tough moments. "It is pretty tough not having your family and people you know and love around you," said Ndiaye. "It is tough, but I know I am here for a reason. Bigger things, not just me or my family, but I got a whole country behind me and supporting me all over the place. So it is tough in a way, but at the same time rewarding, knowing that I am working hard for a reason." Ndiaye and Parker are following in a long tradition of foreign-born NBA players. Henry Biasatti of Italy is credited with being the first international player in the league in 1946. In 1992, though, the year of the original U.S. Olympic "Dream Team," the NBA had only 21 international players on its rosters. Today, that number has tripled to 20 percent of all NBA players who represent 40 countries.